Vortex has become known as a company that brings better than class performance for a great price. Their PST line is made in the Philippines, which is common and makes some great glass and optics for other companies too. The PST differs from the HD line in that they have illuminated reticles. The 1-4 PST is just the ticket for a short to medium range optic. The glass is very good and just as importantly the eye relief is very forgiving. 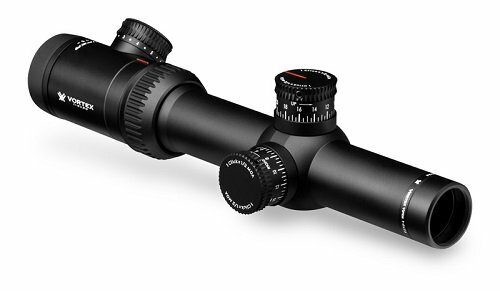 This scope offers more dialing than I think is needed on an optic of 4x, but that is all user preference. The MRAD reticle along with the MIL adjustments means that you can quickly dial if you choose to. For example if you call a 1 MIL wind with the scope at 4x you would just dial 10 .1 MIL adjustments on your windage dial. No complicated math that comes from using a MIL reticle with MOA adjustments. Also the adjustments are very easy to make, so its worth running a rubber band or electrical tape over the knobs to keep from accidentally adjusting them by rubbing them on gear. An important note to mention is that as a Second Focus Plane scope the reticle is only ‘right’ at one power, usually the highest and on this scope it is at 4X. That means a 1 MIL read with the scope at 2x would actually be 2MIL. I’ve used this scope for tactical carbine class with ranges from muzzle to 450 yards and it works amazingly. At these ranges I don’t see a big enough difference in glass that I feel the need to run a different optic. 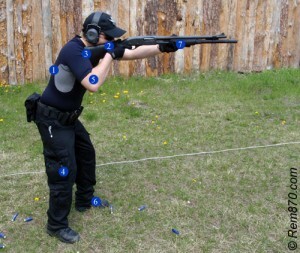 This is a great scope and Vortex is a good company that stands behind their products with great customer service. If you don’t like it and aren’t happy they will do whatever they can to make it right. Buy with confidence, highly recommended. This entry was posted in Firearms and tagged PWS MK114, SFP Scope, tactical carbine, Vortex PST, Vortex PST Review on December 12, 2014 by GunGuy.